How is this for a culinary coincidence? A couple of nights back, I was listening to Simon Majumdar’s newly launched podcast series. Simon is someone whom I consider to be my friend, philosopher and guide in the world of food. He has often advised me about food writing as a career when I reached out to him at times when I felt frazzled with things. He was the one who got me to start what I call the Finely Chopped Food Walks. 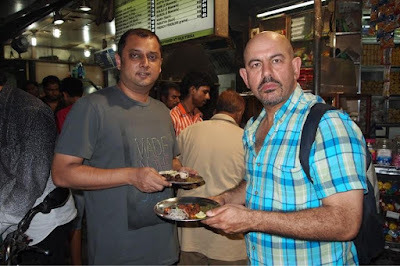 This was after we finally met in person in Mumbai and when I took him on a food walk of Bohri Mohalla. He wrote the foreword to my book, The Travelling Belly, and I owe him for that and a lot more. Most importantly, I listen to whatever he says very seriously! The podcast series is called Eat My Globe after the name of his debut book of the same name. This was the book that had first connected us years back. The first episode of the podcast was on the British national dish from the pre-chicken tikka masala days, fish and chips. A dish that my mother says that she would often take me out to eat when I was a baby in the UK, and you could say that it was the dish which had set off my life as a food obsessed person. A fish and chips outing with my mother in the UK. At the start of the episode, Simon referred to how Fridays during his childhood in the UK were all about fish and chips nights. He spoke about how his elder brother (whom I had met years later in London) and his father would both queue up to get fish and chips packed for home from the local chip shop. In newspapers I guess going, by what my mother wrote in her blog post about the same subject. In the that post, she said that my late father had told her that Friday's meant fish and chips. One of the many things that she learnt when she moved to the UK after marrying him. In the post, my mother wondered about the connection between Fridays and fish and chips. Turned out that Simon had the answer! 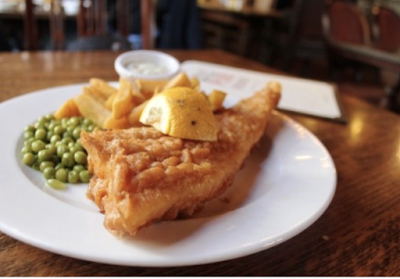 Simon explained in his podcast that the practise of eating fish and chips on Fridays had possibly caught on in the UK as meat was avoided in Christian households on Friday, the day Christ was crucified. Fish was acceptable though he added as it is cold blooded. The practise of eating fried fish he said, came from the Jews who had escaped to the UK in the 1500s fearing religious persecution in Portugal. They opened shops in London selling Pescado Fritto or fried fish. This was bought on Fridays and then stored at home to be eaten on the Sabbath. This was also the time, Simon pointed out in his excellent podcast, when potatoes were introduced to Britain. Do listen to Simon's podcast to listen to the the rest of the story on how the two incidents from the Middle Ages came together on a plate of fish and chips. Now why did I talk of a 'coincidence' at the start of this post you ask? "Patience my friend," to quote Simon from his podcast. Well I loved listening to the podcast before going to sleep that night and then woke up next morning hungry for more food stories and that is exactly what I got when I bumped into my friend, chef Alu, the next day at Lady Baga in Kamla Mills in Mumbai. Lady Baga is a Goa inspired restobar/ gastropub from the house of restaurateur, AD Singh. Sometime back I had heard that Alu, as Aloysious Dsilva is known among his friends, had taken over as the chef of the restaurant. I had been meaning to try it since then. I have been a fan of Alu’s cooking, which is characterised by simplicity and a focus on bold and honest flavours, from his Villa Vandre, Bandra Days. Since then, I have the opportunity of eating at his house and have gone out with him exploring his favourite food joints in Mumbai too. What I realised during the course of our interactions is that Aloo knows his food and is obsessed about it and that this translates into the excellent quality of the food that he cooks. I think he is one of the best chefs that we have in Mumbai today. Just the sort of friend that I would like to have in my corner. I had a meeting at Kamla Mills that day and decided to drop in to have a bite at Lady Baga. I did not tell Aloo that I was coming over. The idea was to have a quick lunch without disturbing him and to move on. I knew the food would be good there even though I had not read the reviews. My plan to do an anonymous 'review’ didn't work as Aloo, ever the hands on chef that he is, was sitting by the door inside the restaurant when I walked in. He saw me and gave me a bear hug and then proceeded to feed me. "I have a meeting to go to", I protested. "I can't be late or smell of fish and vinegar. I can't eat lots of food any more in any case unlike in the olden days. I am trying to lose weight. I rarely have red meat now. I am trying to have more vegetables these days. Fish at the most. And red rice and millets." "No problem,” said Aloo and he rushed off to the kitchen after seating me at an Instagram friendly table by the window. The Goan fish thali with poiee and vegetables too at Lady Baga. They had just launched thalis and half portions it seems at Lady Baga and I was thrilled by the idea. I find portions in Mumbai restaurants excessive when I visit them as a solo diner. Which is why this news was like music to my ears. Especially as Kamla Mills, where Lady Baga is located, is where I often come to for work meetings. I do not like to spends loads of money for working days meals. Options such as thalis and half plates helps one stick to this plan. The fish curry, and the rest of the food at Lady Baga, belongs to the kitchens of the Catholics of Goa Alu told me. Alu is East Indian himself though and not Goan. He told me that he apparently spent a fair bit of time with grannies and aunts in the villages of Goa to get their recipes to create the menu at Lady Baga. He told me that he has sourced ingredients such as fresh kokum and the Goan vinegar and more from markets there. This reminded me of what the chefs at O Pedro say that they have done at Goa as well as what Sandeep Sreedharan says he had done in south India for his restaurant, Curry Tales. Talking to local women to get inspiration for the food they serve in their restaurants. There was a time when only a few legendary chefs such as Ananda Solomon of five star hotels would do research like this. This movement is a great way to bring flavours from the kitchens of India on to our tables and as translated by talented chefs who understand our taste. I feel that instances such as these by chefs in standalone restaurants are most welcome. I am more fond of the Goan Catholic xit codi (fish curry) myself, compared to the Goan Hindu (Gomantak) ones that I have tried. 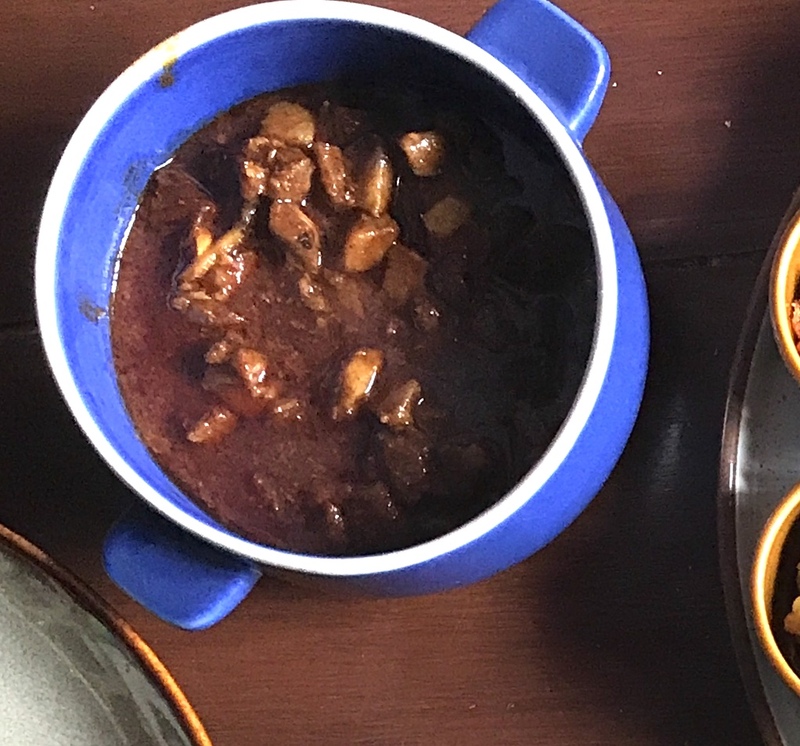 The former has a stronger hit of fresh kokum in it and the curry there has a thicker and more layered texture and punch to it and that is what works for me. I loved the fish curry at Lady Baga too. 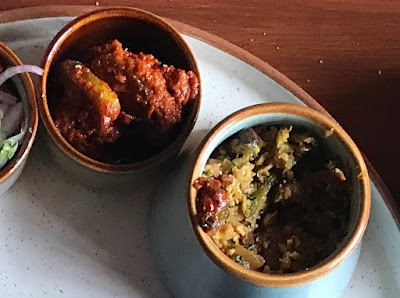 The curry was well balanced in terms of chilli heat, tanginess and sweet, with no particular dimension dominating and the freshness of the fish and its flavours came through. The curry had slices of fresh surmai (kingfish) in it and the texture of the fish was juice. The piece of fish in it was meaty and generous and it was not overwhelmed by the curry as is often the case in fish curry places. 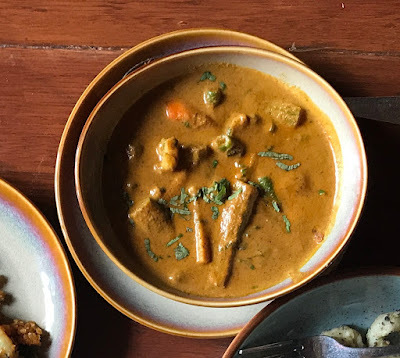 It reminded me of the curry we had at Infantaria at Baga Calangute in Goa once and enjoyed compared to what we had a Goan Hindu run seafood place at Mapusa. 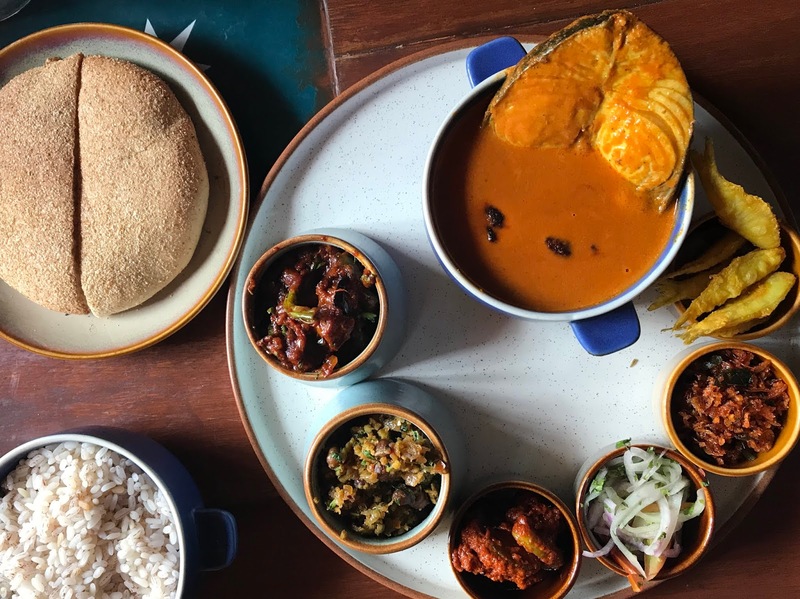 The fish curry at Lady Baga was served with red rice and I was so happy about that. Red rice has become my rice of choice these days as it has a lower GI. The grannies of Goa knew this I guess and red rice is de rigeour at the Goan table. To go with the fish curry was kismur, a dry chutney made with salted dried shrimp. Alus advised me to add this to the rice and curry and it together. The flavours here were heady no doubt, but made me wish that I had carried a mouth wash on me given the meeting that I had to go to. I ate without restraint though and later picked up a cappuccino at Starbucks to mask the flavours of lunch before I stepped into the meeting. Alu served some white bait fry in the thali. A dish I had earlier eaten at Bhatti Village in Goa and loved on both occasions that I tried it. On other days, he offers fish such as mandeli too for the fries. Whatever he gets fresh from the market. Earlier, while I waited for the thali, Alu fed me prawns stir fried in a paste of grated fresh coconut and shrimp and god how flavourful was the masala mix! 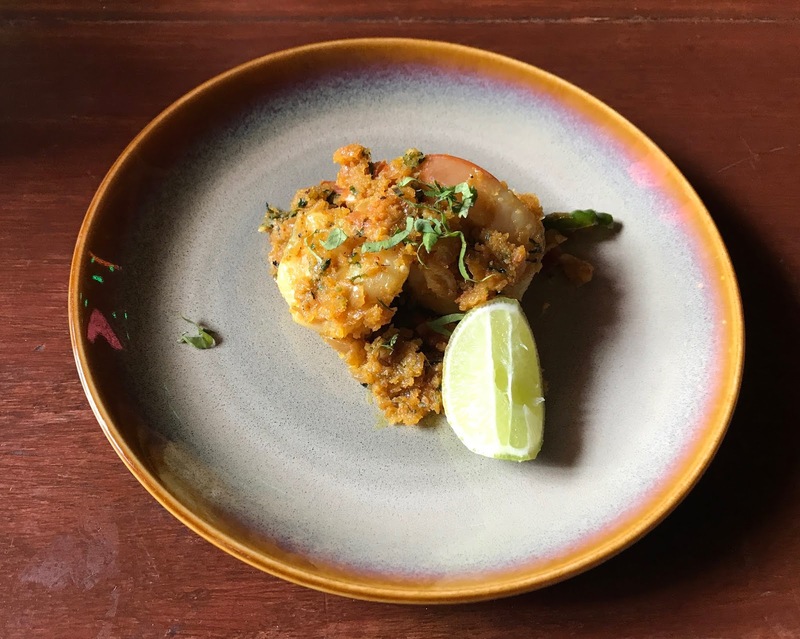 The masala spoke proudly of the intrinsic freshness of fresh coconut and complemented the perfectly fried prawns so well. The prawns were juicier than the average Mumbai tabloid. Alu got me a tasting portion as I did not want to waste any food. Alu also got out a serving of a dish that everyone orders in the shacks of Goa. Fried Calamari. 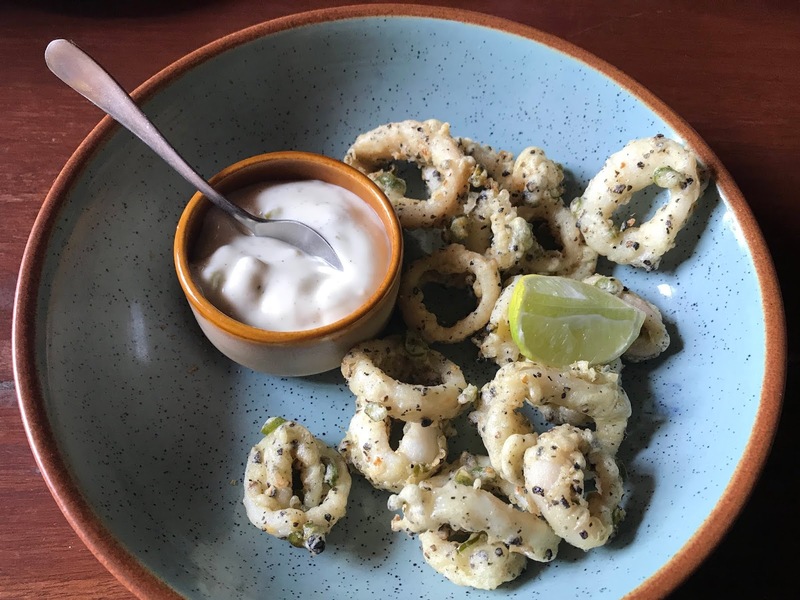 The squids at Lady Baga were fried in a crushed black pepper and green chilli paste marinade which gave them a sharp heat kick. This was balanced well by the mayonnaise served on the side. "Add a squeeze of lime," advised Aloo as I was about to start on them. I was most impressed by how well the squids had been prepared. They were not overcooked and too crispy or undercooked and rubbery. Alu had got it just right. Aloo was rather excited when I told him about my recent experiments with vegetarianism. Turns out that he has introduced a number of Goan Catholic inspired vegetarian dishes in the restaurant. Yes, I know that this sounds like an Oxymoron. What Alu has done, is that he has used masalas typical of non vegetarian dishes of Goan and has combined them with vegetables instead. So there was an ambotik which featured not the usual baby shark or prawns, but was made with long beans and sliced brinjal. The crunchy texture of the beans burst through the sweet and sour intensity of the masala to make an amazing dish. Equally enticing, and very different from anything that I have tasted, was the tendli (ivy gourd) and channa sabzi, where the grated coconut bed that it was served in could rival that of the prawns that I had earlier in terms of subtlety and freshness. I liked the firm texture and bite of the tendli. There was a lovely tendli pickle in the thali too. Who could have though that a vegetable I find so boring could be presented so alluringly? Alu got me a portion of sorpotel too. He knew that I would want it despite all my recent vegetarian and fish and chicken love. I so love the sorpotel that he makes at home after all. That sorpotel is the spicy and red one, in keeping with the tradition of the East Indian community that he belongs too. At Lady Baga, it is Goan and not East Indian sorpotel that Alu serves. Slightly sweeter than the latter. It has a bit more gravy than his East Indian one. The pork belly bits in it offered a riot of pleasure and combined so well with poiee that Alu has given with it. The only deference that Aloo has made to the taste of Mumbai customers is that he had not used pork liver and offal unlike what they do in Goa. The East Indian sorpotel recipe is not big on offal too from what I understand. Poiee is the local Goan bread which has a mix of husk in the dough. Very few bakeries in Goa still make it as it is labour intensive to run these bakeries and it is no longer economically viable to do so with demand going down. 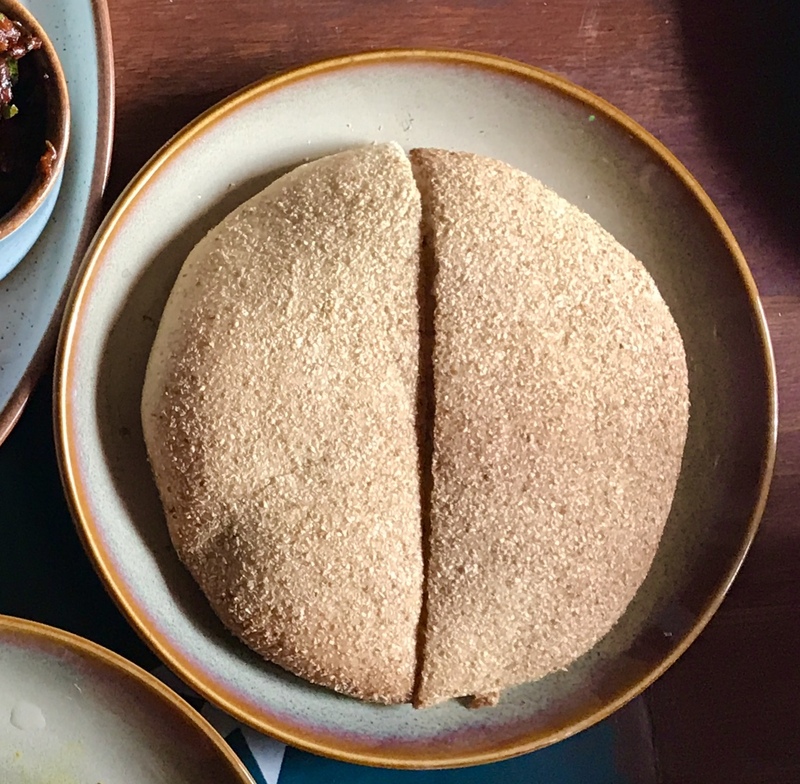 I have had the poiee at O Pedro and Goa Portuguesa in Mumbai which I found to be chewy and not too exciting I am afraid compared to what I have had at Goa. The poiee that Aloo bakes twice a day at Lady Baga, and heats and served when an order is places, though took me to the excellent poiee from the bakeries of Calangute that I had in an unforgettable lunch at a place called Pousada by the Beach in Calangute and at the Le Meredien Goa breakfast buffet. Mopping the curries on offer at Lady Baga with the poiee was my idea of heaven. What about the 'coincidence' you ask in exasperation I am sure if you have read on till now, and I do not blame you for that. Well, Alu brought out a dish which he called 'Friday curry,' that Thursday and that’s where the coincidence sprung up. The curry was coconut based and the flavours of it was robust. In it though was no pork or beef, or even fish or prawns for that matter. Just carrots, cauliflower and beans. The curry tasted so good, especially when I dipped the poiee in it, and then had the soft bread soaked with the gravy. But vegetarian? And Goan Catholic? Is nothing sacred anymore? "Goan Catholic families have something called Friday curry on Fridays," explained Alu. "It is made with whatever vegetables are there at home and has a coconut base and is spicy." "Catholics don't have meat on Friday you see," explained Aloo. "That was the day Christ was crucified." I looked back at him and smiled broadly. Coming back to the Friday curry, now that you know what the coincidence was all about, I must say that it tasted very familiar to me even though I had never eaten a vegetarian Goan curd before. So I called up a young Goan friend of mine from Bandra, Valentine Norhona, about it. He in turn asked his mother, Mrs Phelomena Norhona about it. She confirmed that vegetarian curries are indeed made in Goan Catholic households on Fridays and that this is eaten along with rice and dal. The base for curry could either by the mellow and rather yellow caldinh show said, or the grated coconut based xacuti. There’s a Portuguese connection here too as in the fish and chips of the UK as the Goan Catholics were converted by the Portuguese and these dishes have a Portuguese influence in them. That's when the penny dropped! Alu’s Friday curry was indeed a vegetarian Xacuti and with that eureka moment, my circle of Friday food coincidences was complete.